[caption id="attachment_150" align="aligncenter" caption="Part of the millpond at Blue Mountain Resort, Collingwood, Ontario"] [/caption] Blue Mountain Resort is better known as a winter destination, but we decided to check it out at the height of summer. Our ride up Hwy 400 from Toronto was brutal. Heavy rains all the way. But when we arrived at this Ontario playground on Georgian Bay, Lake Huron, the rain had moved on. 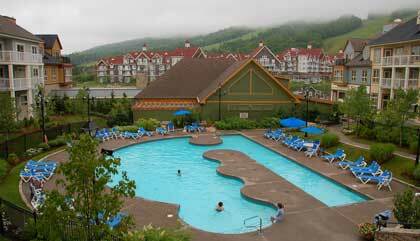 [caption id="attachment_153" align="alignleft" caption="View of the pooldeck from our room at Mosaic, Blue Mountain"] [/caption] Blue Mountain Village is similar to other Intrawest properties such as Mont Tremblant, Panorama and Whistler. Even in summer, you get the feeling that this place rocks in winter with its apres-ski. As we walked through the village, we passed by all kinds of great shops, including Azul Jewellery. I'm a big silver fan and I fell in love with a beautiful Edwardian-style brooch while Glenn hit an expresso bar for a coffee and snack. From there, we passed a martini and tapas lounge, a wings joint, 3 Guys & A Stove, which I first saw in Huntsville so, I guessed they've opened a sister restaurant here. We also passed several gift and clothing stores before I spied a "board" store. Snowboarding and wakeboarding are both big in these parts and this store had all the latest. Blue Mountain is also hosting "Wake Stock" on August 7-9, a big action sport and music festival. [caption id="attachment_156" align="alignleft" caption="The resort spreads out at the bottom of the ski hill."] [/caption] Half way across the village, we saw the Gondola Rides sign and headed for it. Even though the upper Blue Mountains were shrouded in fog, we decided to take a gondola to the top so we could get some pictures of the resort village below. Normally the gondola would be packed with mountain bikers but because of the heavy rains they had closed the trails for the day. This is big bike country and we were keen to see some of the trails that we'd heard so much about. What I didn't expect to see were the amazing wildflowers. Much of the top of the mountain is meadow-like. Just gorgeous. I was also taken by the shale. The Blue Mountains are part of the Niagara Escarpment, a huge ridge of land stretching from Niagara all the way north to Manitoulin Island on Lake Huron. The ridge is some of the world's oldest rock and at the top of the Blue Mountains, much of the vegetation has worn away, exposing the shale. It's also exposed some caves. We found a small one off one of the trails. Further west, at the Scenic Caves, you can actually go splunking, take a zipline or canopy walk or cross a huge suspension bridge that gives you one of the best views of Lake Huron found anywhere. [caption id="attachment_154" align="alignright" caption="Jozo's is a great bar where the locals hang out, named after the founder of Blue Mountain Resort"] [/caption] We chose FireHall Pizza for dinner and walking in I thought oh, oh, popular with young families, this boomer couple may be sorry. So I suggested to Glenn that we sit at the bar away from the crowd. The gal behind the bar was really friendly and recommended the vodka penne so, I took her advice and I gotta say I was pleasantly surprised. Glenn thought the nachos were great too. After dinner, we continued our Blue Mountain walk and ended up at the Blue Mountain Inn. 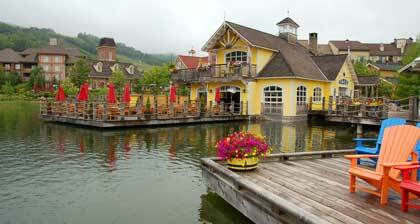 Built by Jozo Weider, an athletic Czech immigrant with a love for skiing, this is the original Blue Mountain resort. The architecture is right out of the 60s. Larry, a guy who has been working here for 25 years told us a bit about the place and about Blue Mountain Pottery. 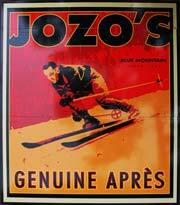 According to him, Blue Mountain was an early ski destination and Jozo, keen to have an off-season income, opened Blue Mountain Pottery. There are clay deposits west of Collingwood so, there was always a steady supply of clay for the company which, at its height, employed 125 people. It closed in 2005 but pottery lives on at Blue Mountain. Recently a Crock a Doodle opened in the village where you can transform ready-to-paint pottery pieces into your own works of art. [caption id="attachment_155" align="alignleft" caption="Samples of Blue Mountain pottery"] [/caption] We're just back from checking out Blue Mountain Resort's own private beach, a little beauty right on Georgian Bay. A beach event had been cancelled because of the weather so, we had the place all to ourselves. Now we're settling in for the night in our home away from home – a gorgeous suite in the resort's newest addition, Mosaic. It comes complete with gas fireplace, a balcony overlooking an outdoor pool, lap pool and hot tub and a kitchen that includes a hot plate, microwave, fridge and toaster. Tomorrow we've got Scenic Caves on our list before heading back into the city. This has been a fun summer getaway.